Frisbee Toss: This game is easy and fun for all ages. The teacher will throw a frisbee to a student, and the student must catch the frisbee to earn points. 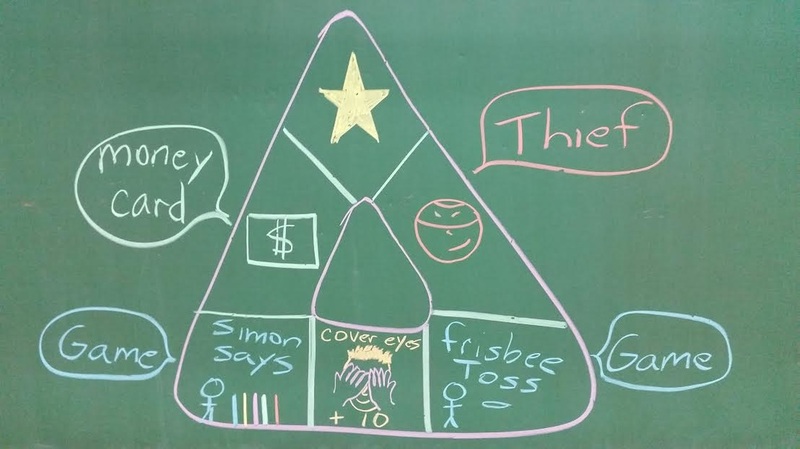 For older students, the student must throw the frisbee back to the teacher to catch (If anyone drops the frisbee no points are earned... including teacher dropping the frisbee!). Depending on the age of students I would throw lightly, or quickly to make it appropriately difficult. Young students: I Wrote different point values on the colored lines on the floor as pictured above. Near lines were low points, gradually getting higher to the last line. Students each get a turn to throw the frisbee to try and land on the lines to earn points. If the frisbee went past the last line it meant that team lost points. This game was fun for very young children. Not so much for children over 7 years old. Simon Says: As seen in the picture of the floor above. 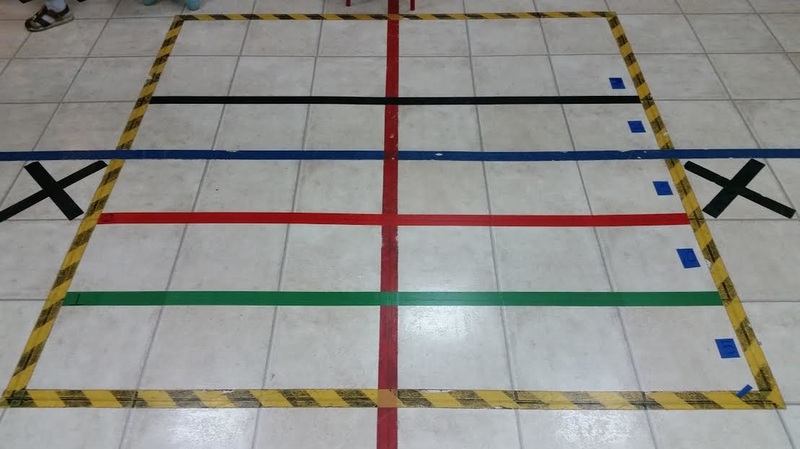 I have put different colored tape on the floor in lines. I could have 4-6 students play at a time, space permitting. The teacher simply calls a color and the students must jump to that color and say the color. If a student is too slow or jumps to the wrong line, that student is out. The last student in the game is the winner. This can be simple, calling out colors one at a time, or difficult calling 2-4 color combinations. All students had a lot of fun with this game. My only fault was not making the line longer so that all students could play at the same time to make it more fun. This was great to review colors with 4 year olds, and great with 16 year olds to work on their memory of many colors in combinations.